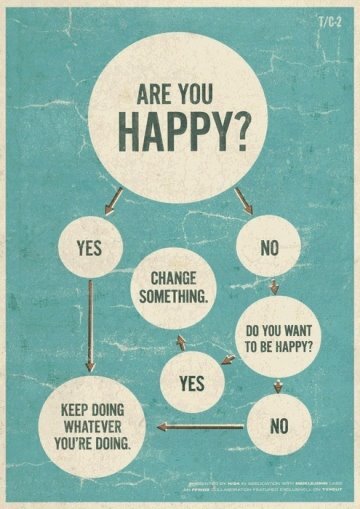 Where is the flow chart for “Change Something” ? Because that is definately not just one step. It’s more like 4,743,094 well, maybe a little less if you’re lucky. I’m not ready to try and be positive and embrace life yet. I’ve been pretending that life was all hunky dorey and wonderful to avoid dealing with the reality that it’s not. That I’m not happy. I’m not exactly sure what I’m not happy about, but I’m not happy. Yes, I want to be happy. But what is the ‘something’ I need to change to get there? It’s not that simple. So, today, I’m still not happy. Because I can’t figure out what that something I need to change is. And once I do figure out what that something is, I have to figure out how to change it. Because ‘things’ don’t happen in isolation. If being alone and living in the woods off the land would be what my ‘something’ is, that isn’t going to work. Because I have family that I love and that I want to be with. And I need to take all of that and me, my feelings, my limitations, and who knows what else into account before I can actually do anything about it. I remember my first boyfriend asking me what I wanted out of life (I was about 16/17)..My gut response was “To be happy”. And he kept asking, “What makes you happy?”, “How do you know if you’re happy?” And I don’t think I really had any responses for him. It was something vague like “I just am”. I don’t know if I’ve ever been really completely happy since then. Maybe I have an unrealistic view of what happy is. Maybe, I’m placing too much importance on being happy instead of just being.